Like golf, low score wins! 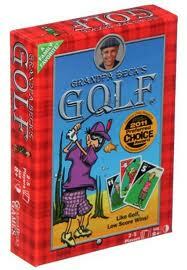 Golf is the first in card games from Grandpa Becks Games of Seattle, Washington. Grandpa Becks Games is a husband and wife team creating card games that are family fun. Their belief is that time spent playing games is time spent building relationships. Golf, like in the sport, the goal is to get the lowest score. There are two ways to lower your score. First, you can collect low-value cards. Second, you can eliminate rows of identical black cards. Players are each dealt nine cards that are arranged face down in front of them in a 3-by-3 grid. To start the game each player turns over two cards at random in their grid. Card values range from the always hard to hit “Hole-in-One” with a -4 score to the infamous “Lost Ball” with a +11 score. A player’s turn consists of choosing a card from either the draw deck or from the top of the discard pile and replacing a card in their 3-by-3 grid. The card being replaced can be either a face up card or a face down card. In any event, the card being played in the players’ grid will be placed face up. If a player lines up 3 cards with the same score either horizontally or vertically, that row of cards is removed from his grid. Not only does eliminating rows of cards lower your overall score, bonus points that lower your score even more are awarded. The game consists of the number of rounds as there are players. The player with the lowest cumulative score at the end of the game wins. We have an open copy of Golf available in our Store Demo Library for you come in and try.